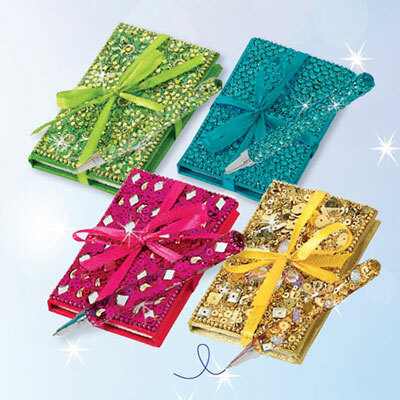 Our Bejeweled Notebook and Pen Sets are a razzle-dazzle gift she'll use everyday! 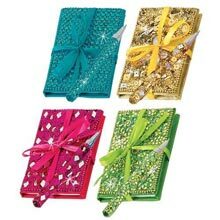 Glamorous, brightly colored notepad glisten with faux gems and glitter. 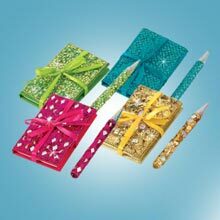 2½"w x 4"h. Matching pen with black ink; 5"l. 2-pc. Set. 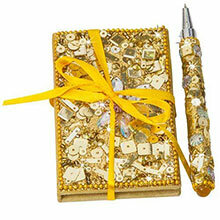 The pens are kinda chinchy but nice gift. The Quality Control of packing and shipping needs improvement. It also needs to be wrapped more secure. This is why I rated it lower.